Many climbers eschew a long approach for time on the rock. All that hang-boarding somehow doesn’t speed up boots on trail...and the dirt really slows down the hover-board. However, at the small intersection of climber, mountaineer and backpacker you have people who desire to punish their bodies and return to the basics of getting high, a different kind than you get while bouldering. Personally, I got into rock climbing because it was the next level of technicality for mountain climbing. I love the skill, focus and commitment climbing requires but the original goal was to reach places that not many people can get to, but farther than 10 ft off the ground. 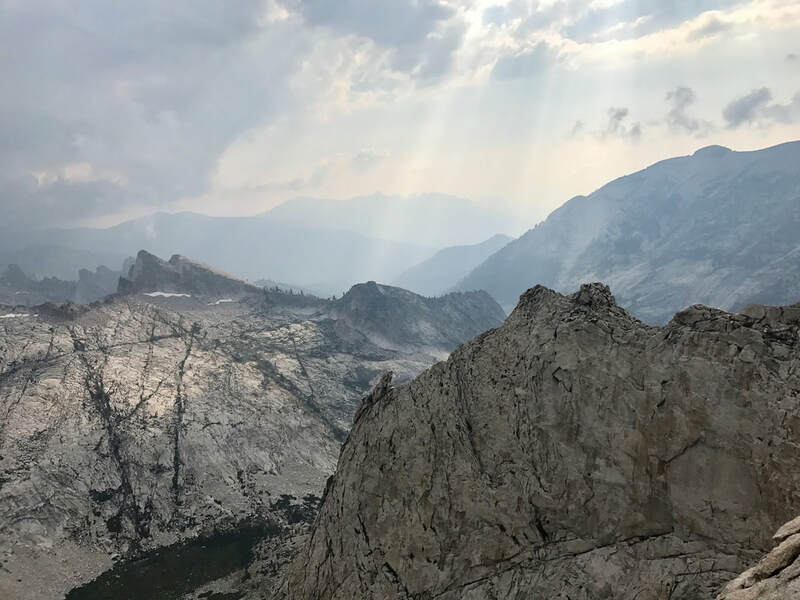 Although small in number compared to the bolt clipping revolution, there are are enough alpine climbers in California that it requires taking up trail running to start a climb in solitude. The rewards of feeling alone on a route not guaranteed just from a couple hour approach. So I've been looking further, deeper, and discovered while it is an amazing experience to climb remote objectives in another country, there is still amazing wilderness to be climbed right here in the United States. This wilderness can be impressively remote while saving the cash and carbon of an intercontinental flight. When I had a job, it was a habit to peruse Mountain Project to discover what was out there. One day I happened upon this description, "longer, more sustained, more exposed Matthes Crest". Wow, Matthes Crest is THE favorite climb for many people and I just stumbled upon a similar route but bulked up on protein powder. Searching nearby climbs to this route, I discovered an amazing cluster high quality granite climbing rarely talked about outside of the nearby, more accessible Needles. As usual, I put an overly optimistic plan together that imagines my body is some machine that requires only mountain air to haul around heavy bags and climb 1500+ ft alpine routes. I spent five days in the backcountry of Sequoia National Park. 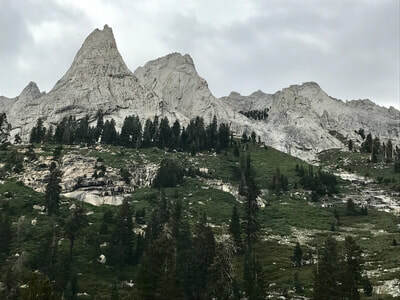 It took two days for the team of three to backpack the 15 miles and 5000 ft from Crescent Meadow trailhead to Tamarack Lake on a well established trail with gentle elevation gradient. Lugging 50+ lbs packs with all the normal backcountry stuff you need to survive along with two ropes and a standard trad rack. The main goal was to climb the bulked out Matthes route, Saber Ridge. Mountain Project provided enough information to find the start of the route but an all too common lacking description of the route. One comment providing a general summary, meant we would get something between a long soloable cruise or 20 pitches. I detail the whole adventure in my trip report, but the exposure made me want to bring an extra pair of underwear. 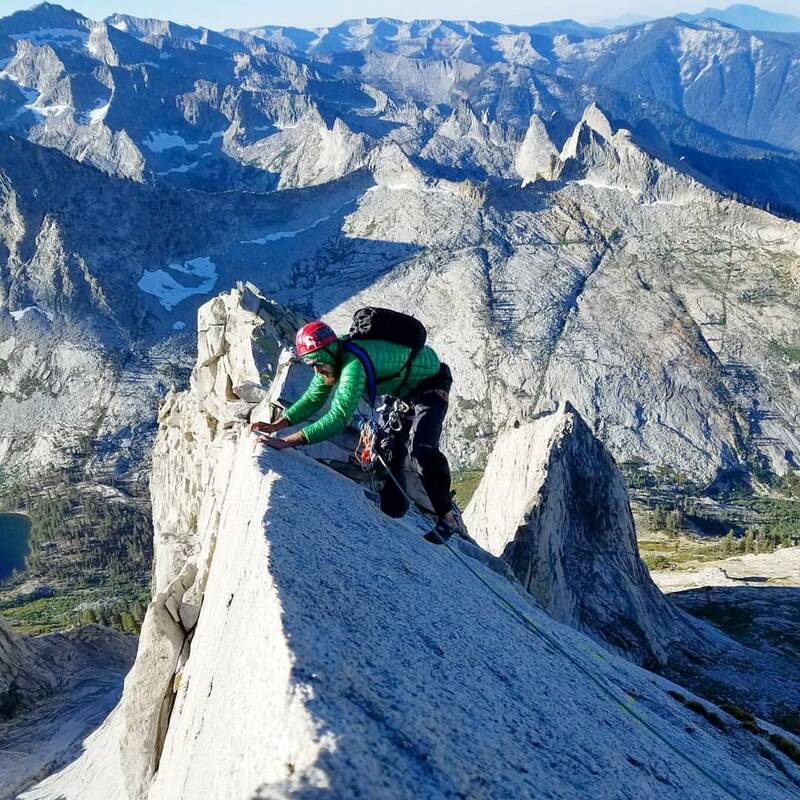 There is nothing quite like pulling on a knife ridge edge while smearing grainy granite with your feet with a thousand feet of air beneath you. The route was amazingly featured from these knife-edge traverses to hand cracks and chicken heads. The grainy rock, lichen, hollow flakes and loose blocks made it feel like we were the first people to climb this route. Its length went on longer than your friend's story about trying to find parking. It was committing enough that we had to unexpectedly bivy 2/3 of the way through the climb -- contorting three shivering bodies into an L-shaped ledge in an attempt to sleep in chilled wind. The next day we stretched the remaining 1.5 liters of water and a bag of trail mix between the three of us over another 10 hours until we reached camp. Don't worry, I'm not trying to sell you on the merits and rewards of an unexpected bivy. However, we were the only ones climbing within a 15 mile radius in an area containing as much amazing granite to rival Yosemite. Contrary to my prior belief that you have to be be a Tommy Caldwell super human to put up first ascents anymore in The States, there is unfathomable room to establish routes here in SEKI. Most routes were established within the last couple decades, with a 5.9 going up Prism in just 2009. Not to mention the dozens of rock features not listed on mountain project. I hear you in the back asking, “what is the point of this story?” Well, the point is that North America still has wilderness. You don't have to ‘take a number’ to climb a route at Smith Rock, but can have an entire bowl of peaks to yourself. Get out, push your boundaries and make your own legends (and hopefully not bivy). 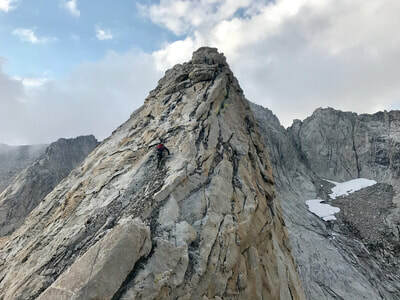 If you scoff at calling Saber Ridge remote because it had a nice trail you should try your hand bush whacking your way out to the Castle Rocks area to join the handful of people who have climbed the amazing granite spire.